This rare and interesting surname is of English locational origin from a place thus called in Northamptonshire, recorded as Torp in the Domesday Book of 1086. The name derives from the Old English pre 7th century personal name "Abba" plus "thorp" a farm, probably an outlying dairy farm belonging to a village or manor; hence "Abba's farm". Such locational names were originally given as a means of identification to those who left their place of origin to settle elsewhere. The surname is first found in the early 17th Century, (see below). Other early recordings of the surname from the church registers of London include; the marriage of Mary Abthorpe to Thomas Joanes, on April 15th 1630, at St. Bride's, Fleet Street; on November 3rd 1660, Anne Abthorpe married John Browne, at st. Benet, Pauls church; John, son of William and Mary Abthorpe, was christened on February 18th 1777, at St. Luke's, Chelsea; and Henry Abthorpe married Sarah Cook on April 23rd 1796, at St. Sepulcres. 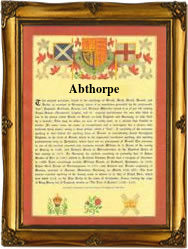 The first recorded spelling of the family name is shown to be that of John Abthorpe, witness at christening, which was dated November 24th 1610, St. Bride, Fleet Street, during the reign of King James 1 of England and V1 of Scotland, 1603 - 1625. Surnames became necessary when governments introduced personal taxation. In England this was known as Poll Tax. Throughout the centuries, surnames in every country have continued to "develop" often leading to astonishing variants of the original spelling.